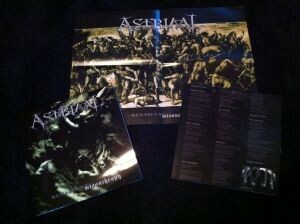 Produktinformationen "Astriaal - Renascent Misanthropy LP"
9 years of waiting have come to an end. Astriaal's debut album was released through Art Of Propaganda in 2012 on vinyl. Expect fast,technical,atmospheric & melodic black metal from Australia. Limited to 300 copies in gloss laminated cover, printed innersleeve and A2 poster. Weiterführende Links zu "Astriaal - Renascent Misanthropy LP"